Chile Ski Vacation Packages offer everything a skiers needs to enjoy the snow with family or friends. While slopes in Europe and the USA are closed during the summer vacation, July and August are the ideal travel dates to ski in the Chilean Andes Ski Resorts. 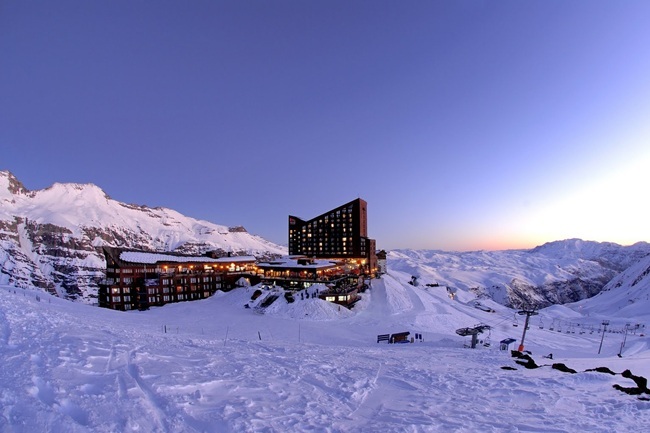 With this Chile Ski Vacation package, spend one week in the famous Valle Nevado Ski Resort. At the ski hotel Puerta del Sol you stay at only 50 meters from the slopes, in comfortable rooms with balconies and magnificent mountain views or overlooking the ski slopes. For family ski vacations in Chile, the hotel offers adjoining room options. Unlimited access to Valle Nevado Ski lifts, Apres-Ski, Sauna, aerobics and stretching lessons and ski and snowboard maintenance are included in this Chile Ski Vacation Package in Valle Nevado. As extension of this Ski Vacation in Valle Nevado, skiers can add a stay at El Colorado Ski Resort, only 60 km from Santiago de Chile international airport. At the ski-in ski-out hotel located between the slopes of Los Zorros and Cururo, choose your favourite slope of the three Ski Valleys of the Andes Mountains: El Colorado, La Parva or Valle Nevado ski resort. After a day’s skiing or snowboarding, relax on the room’s balcony enjoying the beautiful sunset and view of Santiago’s night lights, or use the hotel’s entertainment options. This Chile Ski Vacation Package can be combined with a stay in Santiago de Chile, the Atacama Desert, the Easter Islands or Patagonia.